Arjunarishta (also called Parthadyarishta) is an ayurvedic liquid medicine prepared using natural fermentation method. Arjunarishta is beneficial for people with any type of heart diseases including stable angina pectoris, blood pressure, congestive heart failure, myocardial infarction, ischemic cardiomyopathy etc. Arjunarishta mainly acts on heart and blood vessels having following healing properties. Arjunarishta is very common prescription for heart patients in ayurveda. Its main ingredient Arjuna contains many bioactive substances, which improves left ventricle functions of the heart. Arjunarishta is likely to contain all variety of these bioactive compounds. It improves cardiac function in people with previous or recent history of cardiac trauma or injury and Myocardial Infarction. According to ancient books of ayurveda, Arjunarishta is recommendable in all types of heart diseases regardless underlying etiology. It increases anaerobic cardiovascular performance. Antioxidative characteristics of Arjuna are comparable with Vitamin C. Arjunarishta also has strong antioxidant action. Arjuna is also studied for anti-cancer properties. The main ingredient of Arjunarishta is Terminalia Arjuna, so it is also likely to have anti-cancer action. Arjunarishta is also likely to have similar action because of main ingredient Arjuna. In ayurveda, Arjunarishta is given along with Jawahar Mohra, Kamdudha Ras, or Yakuti Rasayana for treating irregular heartbeat. Arjunarishta is effective on both tachycardia and bradycardia. Fast or racing heartbeat is called tachycardia. In tachycardia, Arjunarishta is beneficial with Kamdudha Ras or with following combination. Arjunarishta should be taken after meal and this combination should be taken with Gulkand. Slow heartbeat is called bradycardia. In such case, Jawahar Mohra, or Yakuti Rasayana should be taken with Arjunarishta. Arjunarishta normalizes the blood pressure and stabilizes it at normal levels. It is beneficial in both cases with low or high blood pressure. Arjuna in Arjunarishta maintains healthy functions of heart, which is likely to work in both cases. It improves cardio-vascular endurance. In high blood pressure, it induces lowering effects. In low blood pressure, it exerts cardio-tonic and strengthening actions. In high blood pressure, Arjunarishta has more effects on systolic blood pressure. It alone is effective in pre-hypertensive, mild hypertension, and moderate hypertension. In severe hypertension, Sarpagandha Powder should be used in following combination along with Arjunarishta. The main purpose of using Arjunarishta is to provide strength to the heart and stabilizing the blood pressure. The general dosage of Arjunarishta is as follows. Arjunarishta is LIKELY SAFE for most people. There are no side effects reported with Arjunarishta. Arjunarishta contains small amount of alcohol. It also contains sugar content. However, sugar content is less than 2 grams per 20 ml of Arjunarishta liquid. Sugar intake can be adjusted accordingly. Dear Sir: Please give in detail the adverse effects of the following on the heart. 1) Piper Longum 2) Piper Nigrum 3)Karkatshringi 4) Anacyclus pyrethrum (Akarkara) 5) Clove 6) Cinnamomum Zeylanicum 7) Mica bhasma (Abhrak bhasma) 8) Rock crystal bhasma (Sphatik bhasma ) 9) Borax (Tankan) Bhasma and 10) Godanti Bhasma. Most of these herbs and medicines (including Piper Longum, Piper Nigrum, Karkatshringi, Cinnamomum Zeylanicum, Clove, Abhrak bhasma & Godanti Bhasma) are considerably safe to use as long as prescribed by physician. No side effects observed these herbs and medicines on heart. However, almost all these remedies have hot potency, which is likely to cause restlessness, vertigo or nausea when used in higher dosage. However, in appropriate dosage, we did not observe any adverse effect. Akarkara may act as cardiac stimulant, which may not be suitable for patients with tachycardia. It is likely to safe in lower dosage, but it may increase heart rate in higher dosage (more than 5 grams per day). Sphatik bhasma may irritate the lungs, but we have no information if it also affects the heart adversely. The long-term use (in dosage above 1 grams per day) may cause breathing troubles. We do not have sufficient information on adverse effects of Tankan Bhasma on heart. No side effects reported on heart functions, lipid profile and other blood test with short-term use of Tankan Bhasma, as per our clinical experience. We never used it more than 5 days on any patient. Thanks for writing such a great and detail article. 1. Is it safe to take any Asava and Arishta simultaneously or should there be a gap while taking the two? 2. Can we mix Arishta like Arjunarishta and Asava like Kalmeghasava at same time if required. 1. Asava and Arishta can be taken together without any problem when required as per patient’s health condition. This is very common in ayurvedic practice. 2. Yes, we mix Arishta like Arjunarishta and Asava like Kalmeghasava at same time when required. Please tell me if sugar patient can take arjunarishta or not. Arjunarishta is likely to contain around 5 to 8 grams sugar content per 20 ml dosage. Therefore, it should be taken only if your blood glucose level is under good control. Alternatively, Arjuna Ksheer Pak is more beneficial. My dad experiences nausea whenever we give him Arjuna Kwath. What could be the reason? Can we give him Arjunarishta instead? Arjuna Kwath taste and high dosage may be responsible for this effect. Arjuna water decoction is not recommendable. Arjuna Ksheer Pak is better option. If your father experience same side effect with Arjuna Ksheer Pak, then you may also consider Arjunarishta. It would be better to consult ayurvedic physician personally for health check up and Dosha Analysis, which are important things for selecting ayurvedic medicines. Does Arjunarisht remove heart blockages? Is it possible to remove blockages and complete cure with ayurveda. 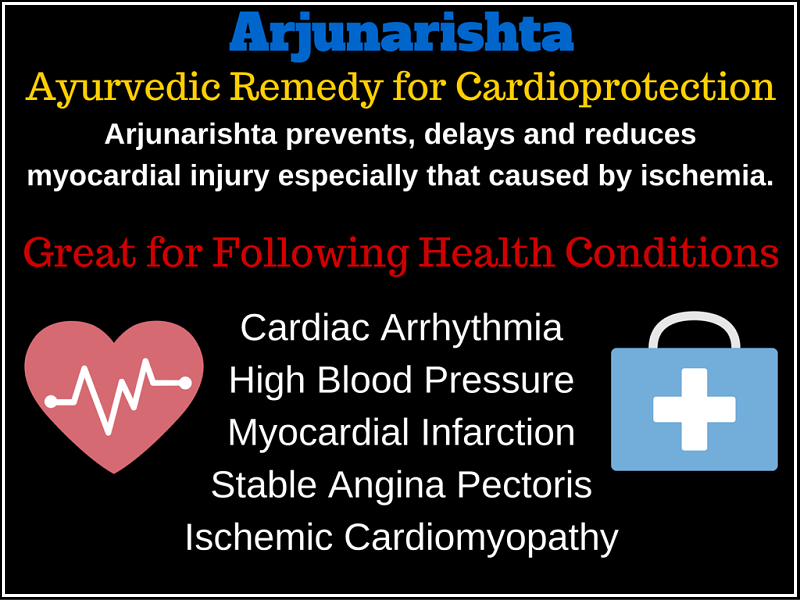 Arjunarishta has cardioprotective effect. It can aid preserving maximum heart functions in heart patients. It can provide significant symptomatic relief in patients with heart blockage or coronary heart failure. Still it alone may not help to remove heart blockage to desired extent. Ayurveda has a good treatment for reducing blockage, please contact your local ayurvedic physician for more detail. I have diabetes, but it is too high post lunch 150, so can I take arjunarishta? Arjuna Ksheer Pak without sugar is much better for you. Can Arjunarishta be taken to get rid of Bradycardia? Can Arjunarishta be had along with Ashwagandharishta? 20 -20 ml of each mixed with 40 ml of water? I m have been advised to take nebicard 5 daily once in morning, which I m following from past year or so. I feel too low, breathless, down, tiered and headache these days. Are they the side effects of this medicine and someone suggested me to take Arjunaristha/Amritarishtha twice daily after meals.. My question is, can I continue both nebicard 5 and ayurvedic tonic to treat my health issues…? Pls advice. Thanks and Happy Deepawali 2016 to all the readers…!!! can i take arjuna kwath and arjunarishta to cure high cholesterol ratio ? i have high sugur but under control? Arjuna Kwath should be more suitable. can i take dasamoolarishta and arjunarishta together for daily health tonic? My mother has been taking aragwadarishta for skin problems since january.Can arjunarishta be added with it? I am 48years old. Sometimes have problem of cough. Rest health is OK. Sometimes feels exhausted after traveling or after doing office work for 3-4 hours continuously. Till now up to last 2 months after path lab testing sugar found was normal. My question is can I take Arjunarishta to avoid future heart related problems? Will it be good for me to keep fit in future life period? Sir..can arjunarishta and amla juice be taken together after food in the ratio of 20:40..or..both in powder form+mishri if taken after food.which one is better? ? DEAR SIR/MADAM NOW I AM USING ARJUNARISHTA AND BRAHMI FOR ANXIETY DISORDER.CAN I USE DIVYA MUKTA VATI ALONGWITH IT. Is consumption of Arjunarishta is safe for kidney. I understand some of the Ayurveda medicine causes increase in the creatinine value. Dear sir, I have undergone angioplasty 12 years ago. All these days I was taking allopathic drugs. Now I have shifted to ayurvedic drug like cardocure. Please let me know that is it safe to change to ayurvedic drugs after 12 years. I am using cardocure since one month. If you are taking ayurvedic medicines under the supervision of an ayurvedic physician, it might be safe. Ask questions/doubts to consulting physician.